Very little attention is paid to marginal and small farmers who constitute a substantial chunk of the population in relatively prosperous states like Punjab and Haryana. Sangrur (Punjab)/Kaithal (Haryana): While the farmers of Punjab and Haryana face opprobrium for burning crop stubble that leads to severe air pollution in Delhi and other parts of north India, there is very little attention paid to their daily grind, particularly the marginal and small farmers who constitute a substantial chunk of the population in these relatively prosperous states that constitute the breadbasket of India. Falling income, mounting debts and high interest rates on loans have driven most of them to daily wages for survival. In Punjab, 35.4% of farm households fall in the category of small and marginal farmers (holding less than five acres of land), and 65.4% in Haryana. Further, Punjab’s 64.51% rural households are landless, compared to 55.91% in Haryana, against a national average of 56.41%. Debts are endemic to these small and marginal farmers. “I remember my family being in debt, right from my grandfather’s time,” Harjinder Singh, a 30-year-old farmer who owns two acres of land in Gharachon village in the Bhawanigarh administrative block of Punjab’s Sangrur district, told VillageSquare.in. He has a debt of Rs 8 lakh – Rs 3 lakh taken from Malwa Gramin Bank and Rs 5 lakh from an arhatiya, one of the commission agents at the mandi (wholesale market), where all crop procurement operations take place. Though the private lender charges 12% interest, and the banks an effective rate of 4% (government provides 3% interest subvention), he relies on the agent, since loan from formal institutions is limited to Rs 3 lakh. In Haryana’s Kaithal district, it is no different for Nahar Singh, who owns two acres in Kharodi village of Guhla administrative block, or for Satnarayan Sharma from Peedal village, who owns 0.75 acre. Nahar Singh has a debt of Rs 7.5 lakh and Sharma a debt of Rs 9.5 lakh, taken from a commission agent, bank and farmers’ cooperative. Both the farmers and their sons work as daily wage labourers for most part of the year, to run their families of four and five respectively. “My son studied up to class XII on my insistence, but found no jobs,” Sharma told VillageSquare.in.Seeing his brother’s plight, Sharma’s younger son shows no interest in studies and helps his father in his farm. According to the National Sample Survey Office’s survey of 2013, the average outstanding loan against farm households in Punjab is Rs 119,500 (third highest in the country) and Haryana Rs 79,000 (seventh highest), while the national average is Rs 47,000. About 53.2% farm households in Punjab, and 42.3% in Haryana are in debt, as against the national average of 51.9%. 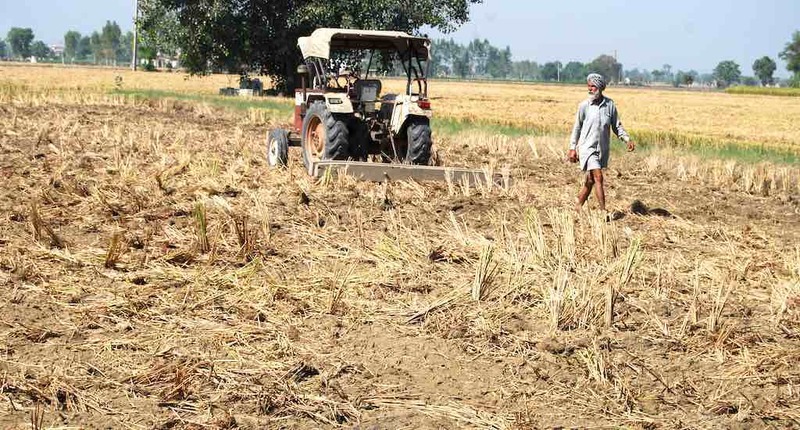 Several farmers in both the blocks of Punjab and Haryana say that their farm income has fallen as the input costs – fertilisers, pesticides, insecticides, hiring cost of tractors and other farm implements – have grown disproportionately in the past few years. “If we are growing paddy, which is not what Punjab farmers used to grow a few decades ago, it is because the government procures it at a fixed minimum support price (MSP) and we get an assured income,” Harjinder Singh told VillageSquare.in. “I admit that paddy made us rich, but only till the mid-90s, after which the input costs have gone up significantly while the MSP (minimum support price) has failed to keep pace. Now paddy is ruining us.” MSP is the price the government pays farmers to buy selected crops that are fed into the subsidised public distribution system. In support of his claims, he said that the price of di-ammonium phosphate (DAP) has gone up from Rs 900 a quintal in 2015 to Rs 2,800; and Applaud, an insecticide that cost Rs 700 a litre a year ago, now costs Rs 1,000. But MSP for paddy has gone up from Rs 1,500 in 2015 to only Rs 1,770 a quintal this season. According to Sukhpal Singh Gill of Punjab Agricultural University, the MSP of wheat and paddy increased at the rate of 2% per annum while the cost of cultivation increased at the rate of 7.9% in Punjab in the past 15 years. It is true that Punjab and Haryana top the list in average farm household incomes in India. However, Gill pointed out that the annual net income of marginal and small farm households were Rs 72,000 and Rs 1.78 lakh, respectively. Their income is much lower than their debt burden of Rs 1.82 lakh and Rs 2.70 lakh, respectively, for 2016-17. That such farmers are banking on daily wages for survival is evident from the SECC 2011 data, which shows that manual casual labour is the main source of income for 48.03% rural households in Punjab and 42.7% in Haryana. Though these percentages are a little less than the national average of 51.8%, it is a worrying development nonetheless. Gill said that small farming in particular is no longer a viable occupation as incomes are not sufficient to meet the basic expenses of domestic consumption, healthcare and education. “Neither Punjab nor Haryana has any policy for marginal and small farmers, except for providing free electricity, water and subsidies to buy farm implements,” Gill told VillageSquare.in. Agriculture policies of both the states have no specific policy prescriptions for small and marginal farmers. Punjab’s 2013 policy lists future course of growth for farmers, particularly the small and marginal and also the agricultural labourers. Haryana’s policy of 2014 acknowledges “the plight of farmers, particularly small and marginal” and says “a lot needs to be done” about land reforms but all it prescribes are: giving credit at low rate of interest and revisiting rules and procedures for land reforms. Gill pointed at the solutions that the Planning Commission had formulated – farm cooperatives, self-help groups and farmer producer organisations (FPOs) to help the small and marginal farmers in particular. “The FPOs are in their infancy in Punjab and Haryana where National Bank for Agriculture and Rural Development (NABARD), entrusted with the task of promoting them, started working two years ago on a pilot basis,” said Gill. According to him, an excellent short-term solution could have been the rural job guarantee scheme under Mahatma Gandhi National Rural Employment Guarantee Act (MGNREGA) providing work to distressed farmers. Gill said that the rich and influential farmers of the two states derailed the program, apparently to get cheap labor for their farms. “We conducted studies in Punjab and Haryana in 2010-11 and found that 50% of the villages didn’t have MGNREGA operations,” Gill told VillageSquare.in. A visit to several villages in Bhawanigarh and Guhla blocks confirmed that MGNREGA works were few and far between. “There has been no MGNREGA work so far this year and very little last year,” Krishan Kumar Gujjar, village council chief of Jhaneri told VillageSquare.in. In such scenario, there is little hope for the small and marginal farmers in the states that form the food basket of the country. “Industrialisation of rural areas is the answer and farming should become a part-time profession,” agriculture economist and chancellor of Punjab University Sardar Singh Johl told VillageSquare.in. Gill said that non-farm employment would be a major long-term solution but there is no such policy in view. This article was originally published on Village Square. Read the original article.